I've never had a savory cookie before, but this was a great first way to try one. Upon first glance at the recipe, you'd think this would be more like a cracker in terms of texture...but it really is like a cookie: crisp on the edges, moist and chewy on the inside. And the flavor is amazing, so amazing that I couldn't stop eating these bite-sized snacks. The flavor of Parmesan is overwhelming (but in a good way): that nutty, pungent saltiness mixed with a buttery richness and hint of heat from cayenne pepper. In fact, they sort of taste similar to Cheez-Its. 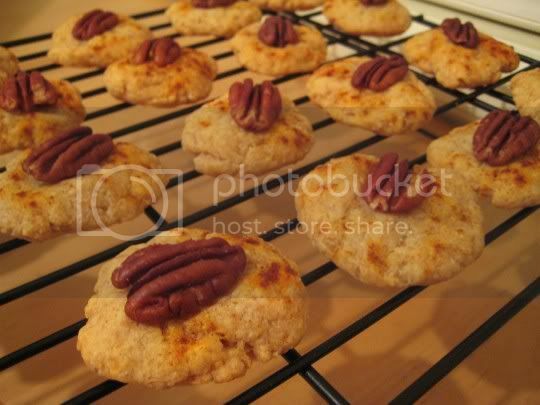 The pecans and whole wheat flour (which is toasted before adding to the batter) further add to the nutty flavor. These cookies were very easy to make, yet I do have a couple recipe notes. The state of the unsalted butter added to the batter is not specified, meaning it wasn't called to be melted, cut in with a pastry blender, creamed, etc. I melted it for the sake of ease. Also, I doubled the amount of water that needs to be added to form the dough. Maybe this is all because I mixed the dough by hand, rather than using a food processor as suggested. Ah well. Make again? Definitely. These are great for a quick finger food or snack.